A student meets with a provider. The 2016 Surgeon General’s Report on Alcohol, Drugs, and Health, titled “Facing Addiction in America,” is a call to action for the school-based health care (SBHC) field and others. More than 90 percent of individuals who experience a substance use disorder as an adult began their use before the age of 18. Assessing risk and protective factors is a service provided by all SBHCs, presenting the opportunity to develop and enhance substance use prevention and early intervention, delaying the onset of use, and decreasing the likelihood of addiction as an adult. Actively screening and intervening with youth will lead to better outcomes academically and overall health and well-being. 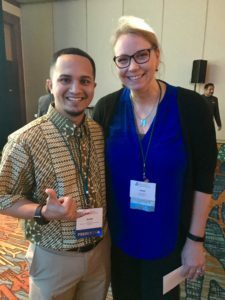 Since 2015, the School-Based Health Alliance, with generous support from the Conrad Hilton Foundation, has been leading an effort to test the adaptation of SBIRT into school health care settings. The process of training school-based health providers in SBIRT and testing the feasibility of the approach across a variety of sites around the country has afforded us the expertise to confront implementation challenges, as well as identify keys to success. Through our own projects and as a partner/convener on numerous other projects, we continue to promote and refine the SBIRT in schools model. Increased training for the SBHC field, using new models and leveraging technology to serve more providers and centers while also creating legacy training tools. 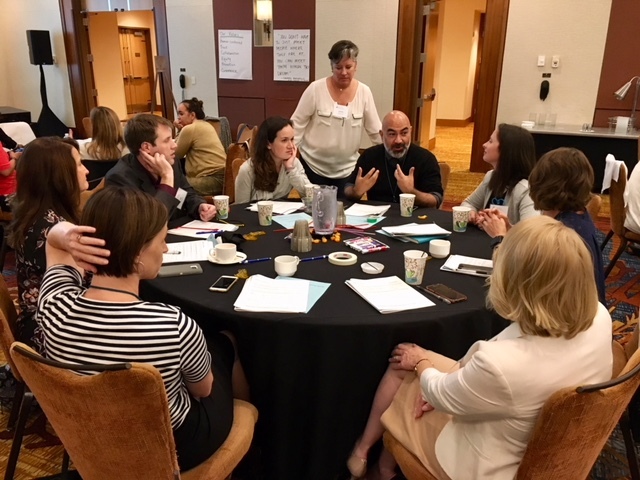 Development of a national school-based SBIRT learning collaborative to share tools and resources, increase partnerships and publication, collectively agree on best practices to share with the field, and promote the development of clear outcome measures. Creation of a comprehensive web-based toolkit, drawing from lessons learned through SBHA’s implementation experiences as well as those of the national school-based SBIRT learning collaborative. A legacy for the field creating an accessible way for sites to pursue implementation on their own. 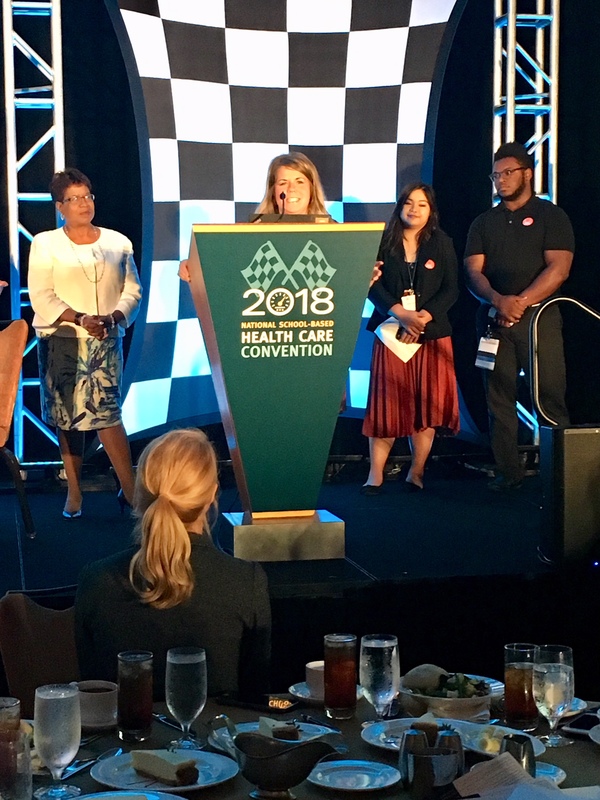 The Alliance is thrilled to announce our continued partnership with the Conrad N. Hilton Foundation for Phase III of our SBIRT-in-SBHCs Initiative. Building on the foundations of prior phases, our work under the new grant will focus on leveraging training technologies for wider dissemination to the school-based field, leading the National School-Based SBIRT Learning Community, and publishing a comprehensive, web-based toolkit. If you’d like to take part in this next phase of the program, email Katy Stinchfield for more information and be sure to check back for the forthcoming Request for Applications! The Alliance is very grateful to the sites and providers whose hard work, collaboration, and willingness to learn have made our SBIRT-in-SBHCs Phase II initiative such a resounding success. Our project ended in December 2018, and we are in the process of compiling data to share with the field. We’re already very impressed at what these sites were able to achieve. More to come soon. What an amazing turnout for SBIRT at the 2018 National School-Based Health Care Convention in Indianapolis! 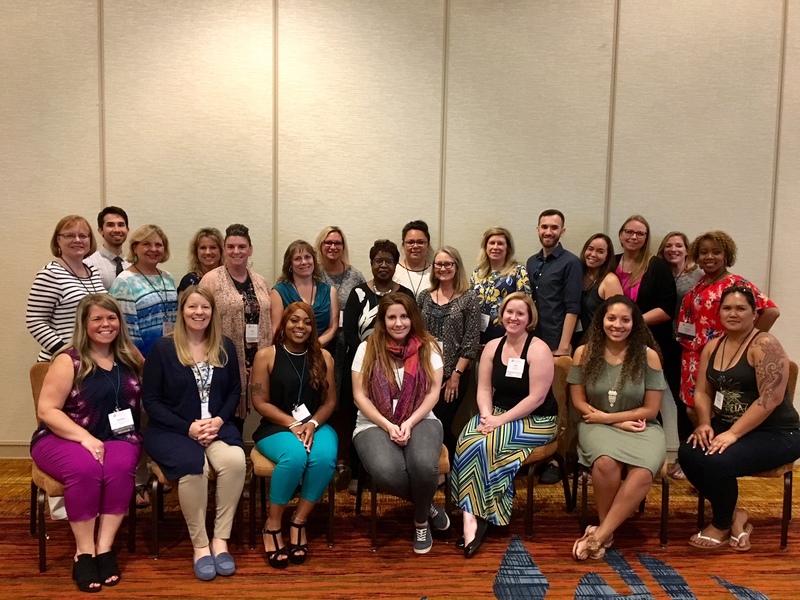 SBHA’s SBIRT grantees engaged in a Motivational Interviewing Booster Training, some fun networking activities, and convention workshops to support their school-based health professional development. We also had some award winners in our grantee group: congratulations to 1st place poster winners Blaine Garcia and staff at Waianae Coast Comprehensive Health Center and to 2nd place poster winner Anna Goddard of Child and Family Services of Southeastern Connecticut. And, HUGE congrats to Amanda Forsmark of Great Lakes Bay Health Centers for winning SBHA’s first annual Rising Star Award! 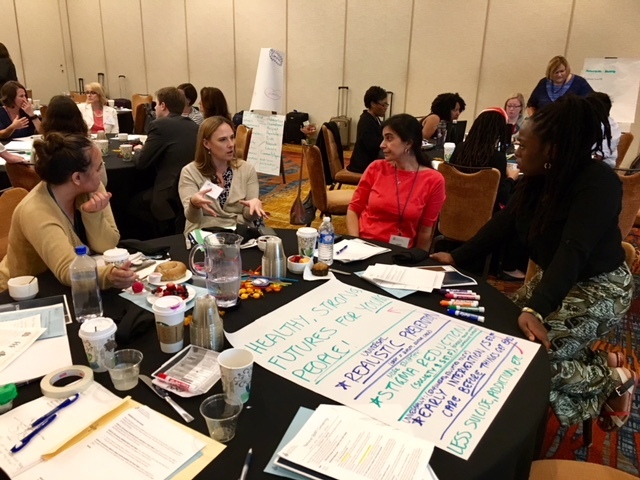 Following the regular convention, SBHA held a National School-Based SBIRT Convening, bringing together professionals and experts from across the country to evaluate the state of SBIRT in schools and collaborate to move the model forward. It was a highly engaging and inspiring few days, and we look forward to what comes next! Blaine & Anna – Poster Winners! Amanda – Rising Star Award! 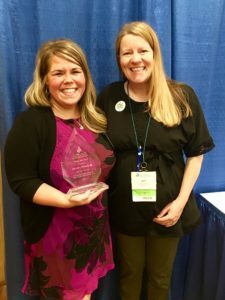 Amanda & Katy – Rsing Star Award! View our project infographic here. SBIRT implementation and data collection have begun across all our grantee sites! The SBHA research and evaluation team continues to solicit site feedback and refine data measures to best serve SBHCs. Program Manager Katy Stinchfield provides regular technical assistance, as well as monthly meetings with each site team, and monthly meetings with Site Champions and guest SBIRT experts. We held another virtual training in March, on the topic of Youth Engagement in Substance Use Prevention, with excellent presentations by Lauren Ranalli, Director of the Adolescent Health Initiative and Amanda Forsmark, Health Educator at Great Lakes Bay Health Centers (one of our grantee sites!). View the presentation slides here. During the fall of 2017, all sites were trained in SBIRT, and are now ready to begin implementation! Training included several webinars, in addition to travel to each grantee location, site visits at each SBHC, meetings with providers and school administrators, promotion of youth engagement and alternatives to discipline, tailored workflow evaluations, a full-day SBIRT training with instructors from the UCLA Integrated Substance Abuse Programs, as well as training in Teen Intervene with SBHA Program Manager Katy Stinchfield. Sites are now working to finalize Electronic Health Record (EHR) modifications to go live with SBIRT in January! The School-Based Health Alliance is excited to announce that four sponsoring agencies and nine SBHC sites have been selected to participate in the SBIRT-in-SBHCs Learning Community. The Alliance will work with each site to support integration of SBIRT (Screening, Brief Intervention, and Referral to Treatment) into the SBHC setting, with the goal of preventing substance abuse, enhancing youth development capacity, influencing school discipline policies, and addressing the multifaceted issues that could be at the root of the substance use. See which SBHC sites were selected! Through the generous funding of the Conrad N. Hilton Foundation, the Alliance is launching a learning collaborative called Screening, Brief Intervention, and Referral to Treatment (SBIRT) in School-Based Health Centers Phase II to prevent, identify, and reduce substance use and depression in middle and high school age youth. SBIRT Phase II addresses two of the key topical areas for technical assistance requests from the field: depression and substance use. Read more about the RFA. SBIRT Phase II will fund up to four SBHC sponsor organizations, each identifying up to three SBHC sites, for the national learning collaborative (up to 12 sites total.) 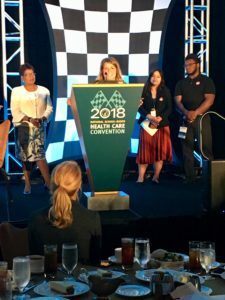 The funding will cover on-site training (up to $2,000 per sponsoring agency), stipends for sponsoring agencies ($5,000 per site), evaluation support, electronic health record (EHR) improvements (up to $10,000 per sponsoring agency EHR), travel to School-Based Health Alliance 2018 convention, and ongoing technical assistance and training. The deadline for application is June 30, 2017. For more information, download the full RFA. During Phase I of the Screening, Brief Intervention, and Referral to Treatment (SBIRT) in School-Based Health Centers Phase I pilot project, the Alliance learned that, with support and encouragement, school-based health centers can and will incorporate SBIRT into their workflow. Providers said that using SBIRT increased their awareness of substance use and other mental health issues in their schools. Read more about Lessons Learned. The Alliance also found that collaborations between several school-based health centers and school administrations successfully incorporated the SBIRT pilot project into alternatives to discipline, such as sending students suspected of behavioral issues due to substance use to the school-based health center for screening rather than out of school; and using Teen Intervene as an in-school suspension program. The Alliance would like to recognize the following school-based health care programs for being selected to participate in Phase I of the Screening, Brief Intervention, and Referral to Treatment (SBIRT) pilot project. Each program will receive training in SBIRT methods and test the feasibility of this approach in their school-based setting. Read more about the SBIRT Approach. Screening: Providers use the CRAFFT tool, a six-question behavioral health screening method for use with children and adolescents, to identifying when a young person is struggling with substance abuse issues. Brief Intervention: When a substance abuse disorder has been identified, providers conduct brief interventions with students through the CRAFFT screening process as mid- to high-risk substance users. Providers use motivational interviewing to help students make their own decision to abstain from substance use. Referral to Treatment: Providers appropriately refer students to treatment for adolescents demonstrating substance abuse disorders requiring care beyond that of a brief intervention. For more information on SBIRT, visit our Health and Learning section.